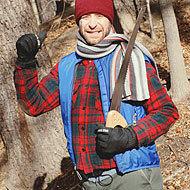 Learn How to Chop Down Your Own Christmas Tree With Delocated’s Jon Glaser! With only four days left until Christmas, it’s not too late to get the tree that you’ve been putting off. But why pay big money to those Christmas-tree farms when you can truly get in the holiday spirit by finding and chopping down your own pine? When we discovered that Jon Glaser, creator and star of Adult Swim’s hilarious witness-relocation comedy Delocated (and author of the book My Dead Dad Was in ZZ Top, out in February), is not just a full-time television personality, but also an amateur outdoorsman, we deputized him to give Vulture readers a helpful tutorial on how to do the job yourself. So click on for his imperative photo instructional: You’ll want to heed his do’s and don’ts. Happy holidays!